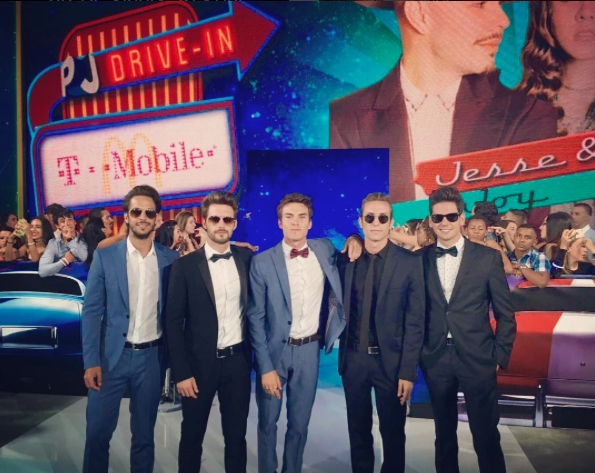 Article: The Remarkable DVICIO Looked So Dashing At The Premios Juventud! After a few days back home in Madrid, worldwide sensation DVICIO headed off to Miami to attend the renowned Premios Juventud! The stupendous and extraordinary band was nominated at the award show in the category “Producers Choice Award.” DVICIO band members: Andres Ceballos, Martin Ceballos, Alberto Missis, Luis Gonzalvo and Nacho Gotor looked so dandy and dashing as they were dressed to the nines at the event. Andres Ceballos and Nacho Gotor also presented an award at the event. Andres Ceballos shared the awesome video as seen below through his Instagram account. Luis Gonzalvo shared the following photo as they were on their way to Miami for their exciting trip which included promos and the award show. After an exceptional time in Miami, DVICIO then packed their luggages yet again and headed off to Mexico for their upcoming concerts. As always, DVICIO is bound to leave everyone mesmerized with a set of unforgettable performances. Check out more photos below of the spectacular band DVICIO at the Premios Juventud! Comment below and tell me or tweet me at @alexisjoyvipacc, what is your favorite song from DVICIO? Follow @dvicioficial, dvicio_andres, @dvicio_missis, @dvicio_martin, @dvicio_luis and @dvicio_nacho on Twitter and check out our VIPAccessEXCLUSIVE updated interview in LA below! Previous Article: The Cast Of Gortimer Gibbon’s Life On Normal Street Had A Fun STEM Panel With Amazon And Google! Next Article: Sierra McClain Has Two Incredibly Exciting, New Projects! Find Out All About It Here!